Learn how to choose flooring for your home! The right home flooring will take your interior to the next level and beautifully accent your design style and furniture. When it comes time to select the perfect flooring for your home, here is what you need to know. Where is the Flooring Being Installed? This is one of the most important home flooring factors to consider. If you are going to be installing the flooring in an area with a great deal of moisture, like a basement or bathroom, you should choose flooring that can handle it like ceramic tile, porcelain tile, or concrete. You should never choose a moisture-sensitive flooring like wood. What Are the Activity Levels in Your Home? If you have kids or pets, you need home flooring that is extra-durable. Solid hardwood is often easily-scratchable, but those scratches can be buffed out with a refinishing. 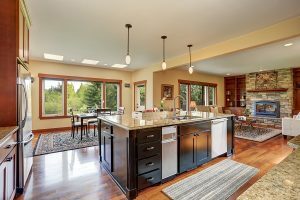 The best heavy-duty home flooring types include ceramic tile, porcelain tile, laminate flooring, laminate vinyl plank (LVP) flooring, and certain types of carpeting. If your budget per square foot is $2.00 or less, laminate flooring and sheet flooring are your best bets. If you are more flexible and can spend up to $5.00 a square foot, you can potentially purchase hardwood home flooring, engineered wood flooring, or luxury vinyl tile (LVT) flooring. If you have plenty to spend, you can purchase just about any flooring, from exotic hardwoods to premium laminates. Many homeowners will initially indicate that they don’t mind maintaining their flooring, but then neglect it once it’s installed. It’s important to be realistic about how much time you have to perform regular maintenance and cleaning on your flooring. If you don’t want flooring that needs much maintenance, vinyl flooring, and laminate flooring are the best options for you. If you don’t mind regular cleaning and only using certain products, any flooring will do. This entry was posted on Sunday, November 19th, 2017 at 5:31 pm. Both comments and pings are currently closed.